The Kims are back in another rousing space adventure. They're on a mission to retrieve a priceless piece of stolen art. Going undercover and maintaining a low profile has never been their strong suit so the chance of all hell breaking loose is almost a guarantee. Thank goodness! I'm new to the world of Kim and Kim by Magdalene Visaggio and Eva Cabrera. I've been aware of it and it looked really cool from afar but never dived in and read it. Boy, was I a dope. It's a fantastic ride full of snappy dialogue and wild action. I should have been on board much sooner. 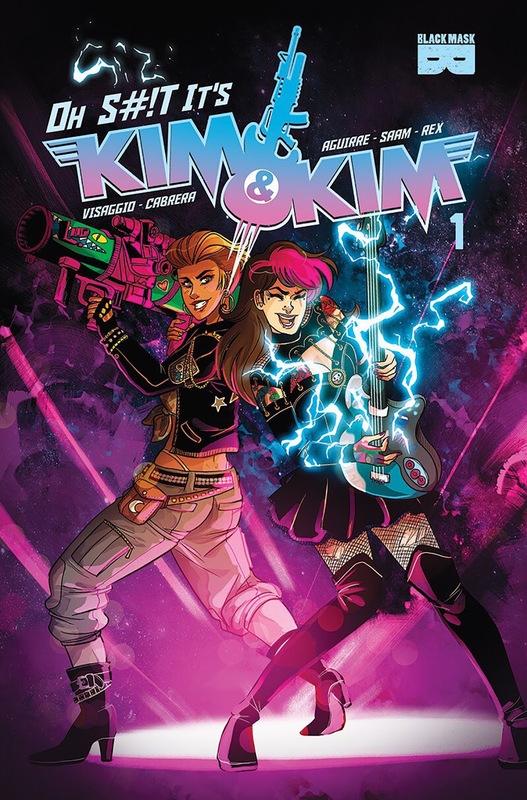 Luckily, 'Oh S#!t It's Kim and Kim' #1 is totally accessible to new readers like me. No longer are Kim and Kim freelance bounty hunters. They've gone corporate and have to work in a much more structured and professional manner. It's an aspect of the revamped business that Kim Q. is having a hard time with. Her feelings are made known quite clearly in the opening pages. It also serves as a brief recap. Their handler is none too pleased with the amount of expensive collateral damage they incur on their missions. Yet, they get a new assignment and off they go into interdimensional space. Visaggio knows these characters so well the dialogue just flows effortlessly. Their banter and monologues hit all the right beats. Kim Q. and Kim D. compliment each other, one's a quick-tempered firebrand and the other is more level-headed and calm. Together they come off as an offbeat undercover duo looking for a master thief in a casino crawling with all kinds of shady characters. Needless to say, things get a little rowdy. I've known of artist Eva Cabrera but it wasn't until she did the opening arc on Archie Comic's Betty and Veronica: Vixens with writer Jamie L. Rotante that I saw how great she was. There are artists with certain intangibles and Cabrera definitely has that. There is a swagger, an attitude that fills her character designs. The clothing, the accessories, the hair, it all combines to give each character a unique appearance and persona. It can say more in an image than with words sometimes. The Fighting Kims are the kind of friends you'd want to have your back, especially in a fight and Cabrera shows you why. Colorist Claudia Aguirre saturates panels with deep rich colors and surprisingly a bit of "lens glare" at times as though you're watching through a filter. She adds a fun look to this sci-fi adventure that is anything but boring. 'Oh S#!t It's Kim and Kim' #1 is a freaking delight. This is what a fun and raucous space adventure looks like. Visaggio, Cabrera, and Aguirre create an inviting, cursing, brawling, and approachable story that totally entertains. It's never too late to jump on the Kim and Kim bandwagon.